AMTA wants to usher in the new year by offering its 2017 members a new, FREE e-course titled, Self-Care for Music Therapists: Insights from Experienced MT-BCs. Normally a $125 value, this e-course is being offered as a member benefit to current 2017 AMTA members absolutely free along with 3 CMTE credits upon completion. Register as a member today to take the e-course and save BIG! See below for details. "Self-Care for Music Therapists: Insights from Experienced MT-BCs"
Presented by: Deforia Lane, Rachelle Norman, Marcia Humpal, Russell Hilliard, Lisa Gallagher, Blythe LaGasse, Amber Weldon-Stephens, Ed Gallagher, Cathy Knoll, Ami Kunimura, and Amy Smith. 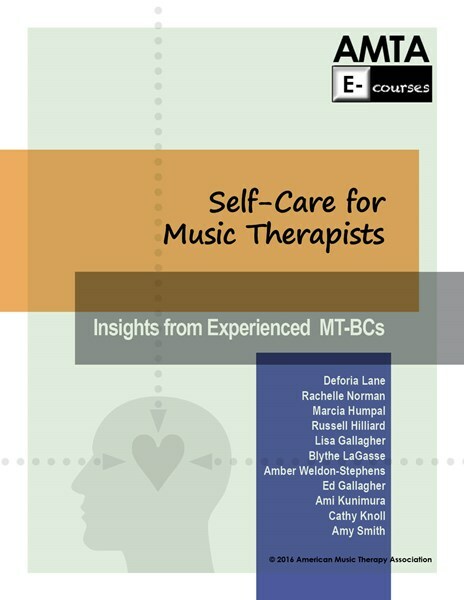 Self-Care for Music Therapists: Insights from Experienced MT-BCs, provides a practical resource to help music therapists explore the topic of self-care and to get some ideas from the personal and professional experiences of their music therapy colleagues. Self-care is a topic best addressed from several different angles since music therapists have such different personalities and vastly different experiences in our daily lives, and because we all approach our professional careers from different perspectives. We invited eleven experienced music therapists to provide 10-15 minute audio segments talking about self-care from their viewpoint, sharing a few tips and telling a short story or two about keeping their lives centered in the midst of the ups and downs of their music therapy career. And check out our entire e-course catalog for more affordable, convenient e-courses when you're in need of critical continuing education and CMTE credits. More new e-courses are planned for 2017 and will be available soon! With a big transition facing our nation, what an excellent time to both provide and receive support from AMTA. As I look forward to my second year as your AMTA President, I am excited about things to come. For me, some of those things include regional conferences this spring and the World Congress of Music Therapy in Tsukuba, Japan this summer. The business of the Board of Directors continues with electronic ballots, conference calls and the upcoming Mid-Year meeting at the end of May to coincide with the NIH/Kennedy Center partnership convening on “Music and the Brain” in June. If you have not already done so, I invite you to join AMTA for 2017. The membership year runs from January 1st through December 31st. We ended 2016 with AMTA’s largest number of members in our history so far. I am grateful to our community of committed supporters, investing in their future and in the profession of music therapy by investing in AMTA. Thank you! While tracking CMTE credits during the recertification cycle, remember that AMTA has E-courses and podcasts that may be helpful toward the CBMT requirement. These courses are also available to the public. The free Disaster course offered to members last year was cited as a “Best Benefit Ever” by the American Society of Association Executives in its publication, Association Now. Appreciation to all the individuals who contribute their expertise and to “Team Knoll,” Cathy and her son Dwight, for making this information easily accessible. Then, mark your calendars for the 2017 AMTA National Conference in St. Louis, Missouri, November 15-19, as we explore “A Mindful Approach to Music Therapy.” Plans are already under way to make this another informative and inspiring time of learning. Watch www.musictherapy.org for the call for papers this spring. Wishing you and yours a happy, healthy and productive 2017! FREE E-Course: Self-Care for Music Therapists: Insights from Experienced MT-BCs. (Regular Cost $125- includes 3 CMTE credits.) For more information click here. NEW Oxford Platform later this year. Click here to read more. Subscriptions to Journal of Music Therapy & Music Therapy Perspectives when you join AMTA, a $576 value! Discounted prices for items in AMTA’s online store including publications, e-courses, and national and regional conference discounts. Advocacy and support from the AMTA office through government relations. Click here to read more. AMTA prides itself in giving its members the best it has to offer! Take a look at these YouTube videos commenting on the benefits of AMTA membership—We Are AMTA! Music therapist Kristen O'Grady discusses the disaster response outreach and support she and others receive from AMTA. Tara O'Brien talks about how membership in AMTA benefits students. Music therapist Lana Hawkins discusses the advocacy and representation she receives as a member of AMTA. Victoria Storm discusses how the resources she receives as a member of AMTA help her in her practice. Amy Calderon discusses how membership in AMTA benefits students. Dr. Andi Farbman discusses benefits of membership in AMTA and AMTA's recent recognition in the Association Now's "Best Benefit Ever" column. Dr. Sheri Robb and her team were awarded a $1.4 million grant from the National Institutes of Nursing Research. Congratulations on this prestigious award! Click here to read more. In the past 30 days, AMTA provided 33 referral lists of music therapists. In the past 30 days, AMTA posted 14 new music therapy-related positions. Calling all fashion gurus! Consider organizing a clothing sale with new or gently used clothing and accessories. Donate all proceeds to a local charity—like a music therapy organization or soup kitchen—then donate any of the remaining clothes to a local shelter. Got a green thumb? Consider taking up a plot at the community garden or volunteering to help maintain the unclaimed or common areas. If there’s not community garden in your town, gather your fellow greenies and get one started! Pets make us smile! Consider bringing your pet to a local senior center, veteran’s club, or hospital to bring joy to the residents. Of course, this may not be the right choice for every pet or every location, so be sure to consider the demeanor of your pet, the needs of the patients, and the policy of the location before you try giving back in this way. For more information on guidelines to share your pet, please visit www.petpartners.org. There are lots of places looking for volunteers to help with activities for kids—schools, after school care programs, day care centers, camps, the YMCA, mentorship programs, and more. You may be able to help a child learn to play an instrument, ride a bike, make a free throw, fold origami, grow a plant, and more—it just takes a phone call and a little patience. Next time you’re baking for a family or work event, consider doubling your batch and bringing the extras to a local police station, veteran club, senior home, or soup kitchen. There are plenty of places that will appreciate your skills! If you’re lucky enough to be good at long division or skilled in Spanish conjugations, consider sharing your smarts with local students.Many schools and after school programs would be happy to take on a volunteer to help students improve. Got a way with words or a sharp eye for editing? Consider volunteering at a local high school, transitional houses, shelters, or even veteran assistance programs as a resume editor. You might even be able to get a local business to donate resume paper. Looking for some other way to give back in your community? Head to VolunteerMatch.org to find opportunities closest to you. You might be surprised how many ways there are to give back right in your neighborhood! To see the full Huffington Post list, click here.